Some Stuff To Get EXCITED About . . . There's so much going on right now that it'll make your head spin. Allow me to get you up to speed . . .
• John Manion's working overtime to open the Argentinean-focused La Sirena Clandestina in the West Loop in early August. As I wrote back in March, he's secured Poi Dog Pondering's Frank Orrall to act as music curator. Another great contributor to La Sirena will be San Diego native Justin Anderson, who's set to create an all-Latin-inspired cocktail menu. Formerly of The Bedford and Branch 27, he's planning extremely approachable elixirs for the first few months. 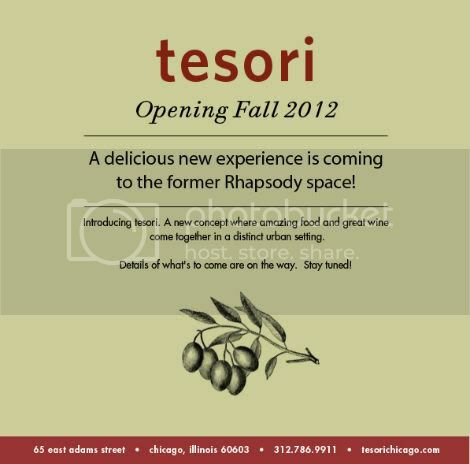 "We want to make this experience fun and approachable for those coming in dining," Anderson said. "Six months from now, I'd like to be more technical with the cocktails." One thing you can expect right out of the gate is a permanent section on the menu that he's calling "Latin Classicos." That's where he'll put his spin on the daiquiri, caipirinha, Pisco sour and mojito. He'll also include Fernet Branca & sugar cane Coca Cola, which he said is the unofficial national drink of Argentina. Look also for every wine to complement each dish. Vera owner and wine director Liz Mendez recently returned from Spain, where much of her excursion focused on the Castilla y Leon region. She tells 312DD that during the trip she saw various aspects of cuisine, wine, cocktails and service that inspired her to make some menu changes at the West Loop hot spot she owns with her husband, Executive Chef Mark Mendez. The most significant change, she says, is the new Otro Bar, which used to be called the Cheese Bar. "Otro Bar at Vera will still feature artisanal cheeses from around the world and Jamon Iberico sliced to order, now available by the half and full order," she says. "Guests will also enjoy the bounty of the season from fresh salads, marinated vegetables, fresh fruit in sweet and savory forms, as well as classic snacks such as marinated olives and boquerones (anchovies)."